This comment was posted to reddit on Mar 29, 2015 at 1:33 pm and was deleted within 13 minutes. 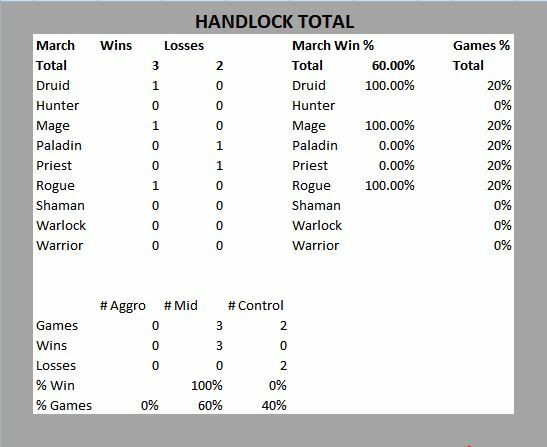 Hey everyone, this is PSnipe and I wanted to share the meta data I've collected during my March legend climb and answer any questions regarding match-ups for Control Warrior and Zoolock. 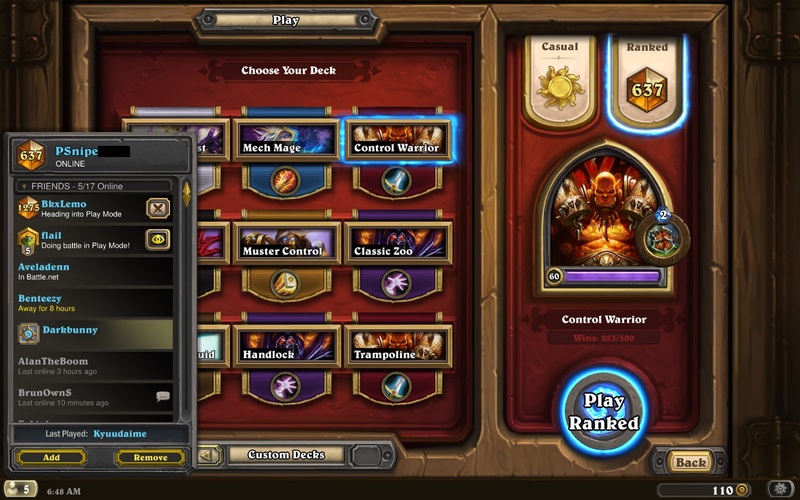 I focus on playing Hearthstone competitively but, like many people, I also deal with making my climb to legend each month with limited time (I play less than 10 games a day on average), so I'm also open to answering any questions people may have regarding strategies for climbing to legend. 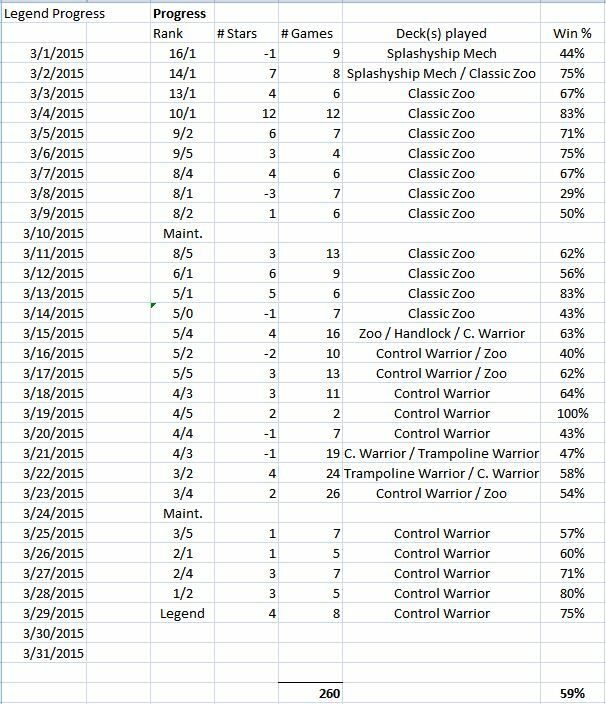 Here is a table of the decklists I used, as well as the stats for each deck against classes and recognized decklists. Under the Vs. 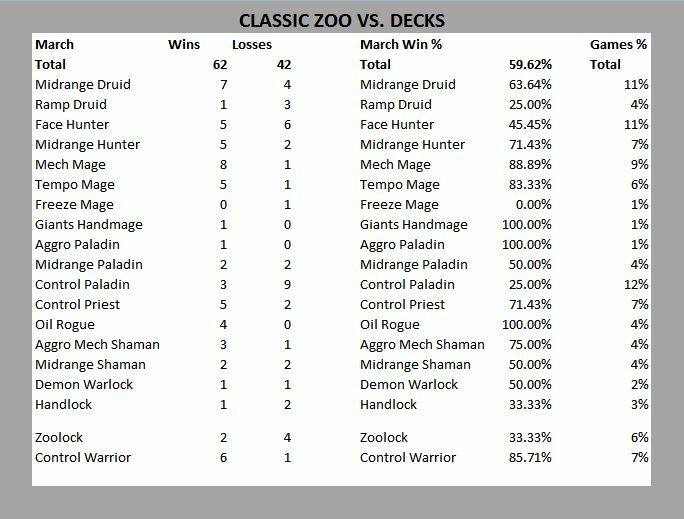 Classes table, I have also broken down the deck's win rate against Aggro, Midrange, and Control decks. Footnote: There is a slight variation in number of games between classes and decks as some decks did not fit known archetypes. This is the deck I ultimately piloted to Legend from Rank 5. Decklist comments - Compared to standard lists, my Control Warrior decklist runs x1 Unstable Ghoul, x1 Bomb Lobber, and x1 Ragnaros instead of Alexstraza. Unstable Ghoul: A really versatile card in this deck that helps in a few ways. I prefer this card over whirlwind as it puts not only a body but a taunt on the board. Unstable Ghoul benefits Face Hunter match-ups (due to the taunt and several 1 health minions), Druid match-ups (another taunt in addition to Sludge Belchers, also enables Execute), Paladin match-ups (counters Shielded Mini-bot, dudes and Muster for Battle [weaker than WW if they follow with Quartermaster]), Zoolock (taunt and counter Imp-losion and 1-health minions), and Oil Rogue (another taunt which denies Southsea Deckhand and prevents the Rogue from doubling their blade damage by hitting your face then using Blade Flurry). You can also drop Acolyte of Pain and/or Armorsmith behind Unstable Ghoul or when you are going to trade for more cards/armor off of the deathrattle. One advisory though, keep in mind how the opponent could use the deathrattle against you and your other minions on board (e.g. activating opponent Warrior's Grommash, giving one extra damage against your board for a Druid Swipe, etc.). Bomb Lobber: I feel more has already been said here, so as much commentary is not needed. I prefer this card over Piloted Shredder for the tempo gain, the flexibility in gives you as pseudo-removal, and it's ability to target minions you may normally be unable to (e.g. Shade of Naxxramas). Ragnaros vs. Alexstrasza: My goal for this Warrior deck is to take a more aggressive stance in most match-ups instead of waiting to Alexstrasza them before dropping my big guns. 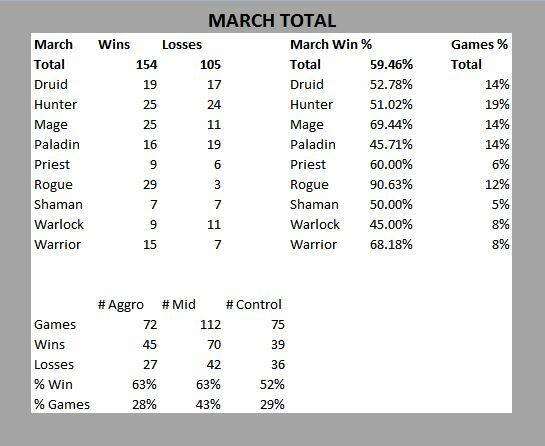 I found by the time I dropped Ragnaros, my opponent's rarely have a good answer for him, and this month I preferred his immediate board impact over Alextrasza due to the large number of midrange decks being played this month. Although Alexstrasza is more superior in Control match-ups and gives you a defensive bounceback in some aggro match-ups, I felt this dragon's impact generally offered little to no value for the board state in most match-ups this month compared to Ragnaros. Face Hunter: I was a bit slow on learning this match-up and how to prioritize my health. Although the chart shows a 64% win rate, my win rate after adding Unstable Ghoul was 78% (7-2). Oil Rogue: This is one of the primary reasons to play Control Warrior. At a whopping 91% win rate (20-2), Oil Rogues were also the most common deck I faced on ladder. You have to be very unlucky to lose against Oil Rogue, with my two losses being attributed to drawing zero removal (FWA, Death's Bite, Shield Slam, Execute) until turn 7 or 8. This was the most effective deck I found for efficiently climbing the ladder to Rank 5. It is a killer for Mech Mage and Tempo Mage and I also found it to be strongly favored in my early climb against Face Hunter, though the win rate against Face Hunter slipped significantly after Rank 5. 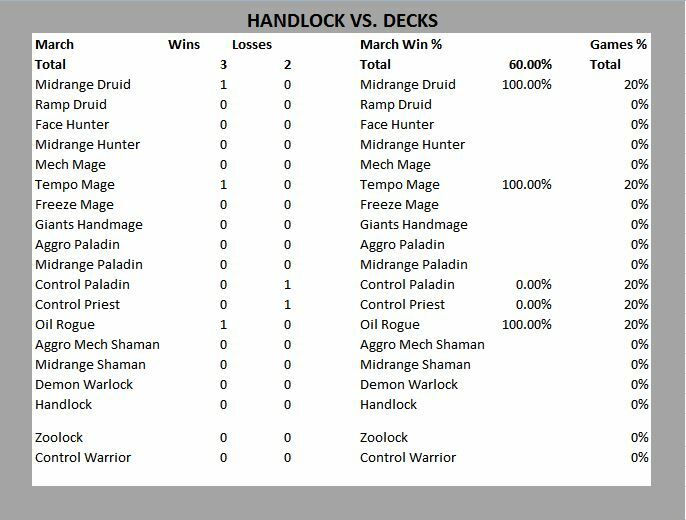 Zoolock also has a favorable win rate against Midrange Druid due to their lack of board clear and Oil Rogue due to the deathrattle minions and limited board clear options with Blade Flurry. I have seen Payton's Zoolock list as well as a couple others with the higher mana curve and bigger drops and I simply don't like them. They obviously have seen some success on the ladder for some people, but I find the higher curve gives too much inconsistency for a Zoolock deck. For thoroughness I included every deck I used in this post; however, these decks I used in a limited capacity for one reason or another. 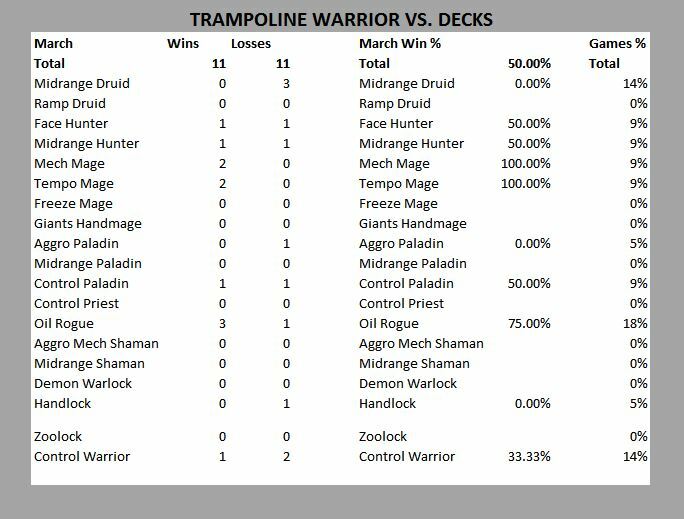 Trampoline Warrior - Very interesting deck made by /u/Glutol and within my wheelhouse as a Warrior player, but I couldn't pilot this deck with a reasonable amount of success. Anything this deck could beat (besides Mech Mage), I could beat more consistently with Control Warrior. I attribute the lack of success to my lack of experience with playing it. Handlock - I had never tried Handlock before I wanted to get a better breadth of experience for when I play against it. Seems like a strong deck. 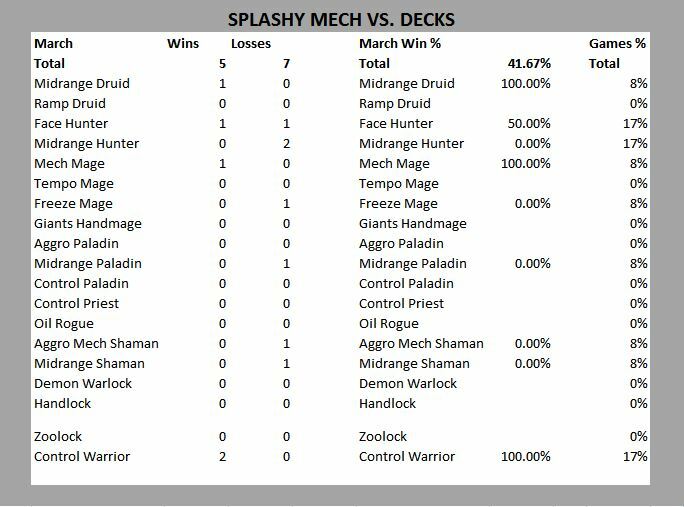 Splashyship Mech - This is a very unique deck made by my friend Splashyship at the end of last season. He didn't intend for it to be competitive and was messing around in legend ranks with it. 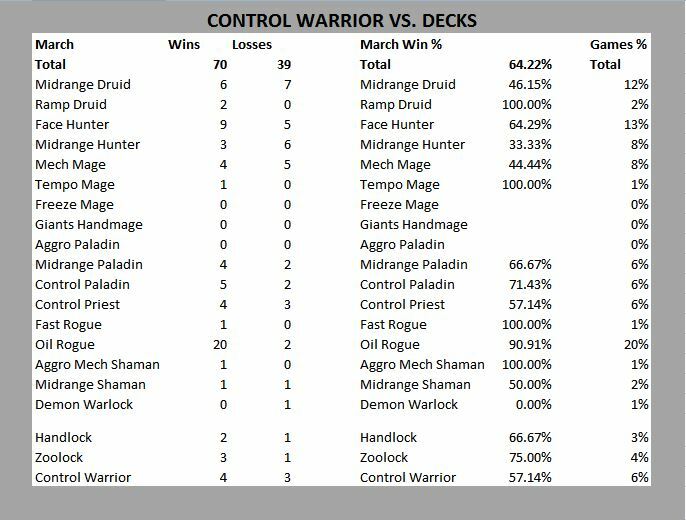 It is solid against Control decks like Control Warrior, but ultimately too inconsistent against several other decks. 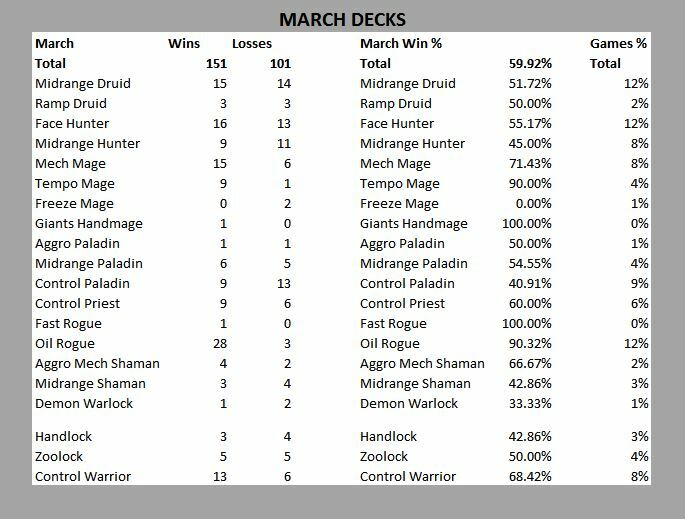 Also noteworthy is that 43% of the decks I played against were Midrange decks (vs. 28% Aggro and 29% Control), with the midrange charge being led by Oil Rogue and Midrange Druid. I will footnote here that my count of Control Paladin vs. Midrange Paladin may be a bit fuzzy in some cases as it is difficult to distinguish the two without seeing a large number of cards. Well, that is it for now. Please leave your comments/questions below and I will my best to respond to them. Thank you to this sub for its wonderful contributors and wealth of data.